In theory, you can sell anything to anyone. But naturally it’s not as simple as that. Customers are well aware these days that they can get a similar (or in the case of products, perhaps identical) offer elsewhere. So it is often the sales experience which will differentiate you from your competitors and get you the sales – and that is shaped by the way you sell. Understanding your customers’ purchasing journey is key to getting this right. Whatever they are interested in they may well start by finding something online, then window shop to compare prices and decide on the exact product they want to buy. They may then visit store websites or go in-store (especially in the case of fashion purchases, for example, where they are likely to want to try things on for size), before eventually buying either online or in-store. This video gives a useful example of a fashion purchase journey. Define your buyer – before anything else, you need to know who your customers are. To understand your customers’ wants and attitudes, you need to do your research. Forget about sales, at least at the beginning of the relationship. Make it about them, and what they want (see Brand Attitudes below). Build rapport before you start trying to sell – give them something first, sell later. Ask questions, and listen to the answers. Approach them on their level – inform but don’t patronise, and use the platforms they prefer. Never forget that you’re selling to a person with individual preferences and quirks. That last one is possibly the hardest to follow, especially if your business relies on marketing automation and AI, and less on individual sales people. I wanted to share some thoughts with you about that, to help you gather your own insights into your target markets and their online purchasing habits. Understanding the customer purchasing journey for your brand depends on knowing who your customers are. Global Web Index have developed a fascinating infographic, which I’ll break down here to help you understand this in more detail. You can see the complete infographic here. Different generations have varying shopping habits, and the way that they use and interact with brands online – consuming and contributing to the data and information available – varies too. It’s important for you to understand this, and to know who your brand’s customers are, so that you can provide the buying experience that incorporates the aspects that they find most important. The online buying journey breaks down into three broad stages. Here, I’ll go through each and highlight some of the key ways in which people’s buying preferences differ. 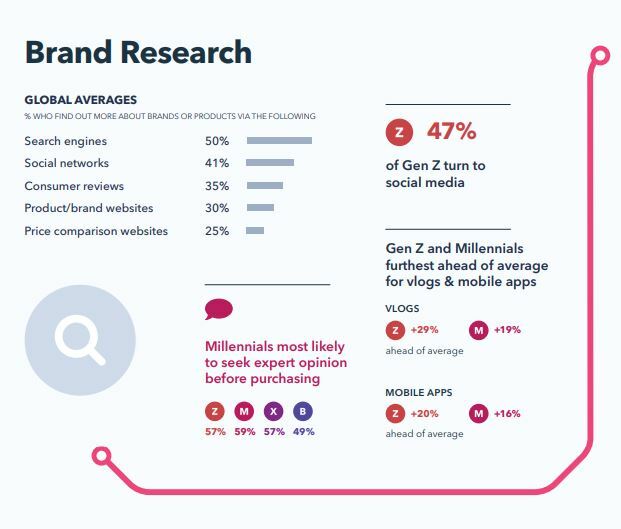 You can see from this that the younger your customer base, the more vital it is that your online experience incorporates both mobile apps and a strong social media presence – including vlogs. Your Gen Z and Millennial customers will turn to others for expert opinions before purchasing. So your brand needs to have a strong following from the brand advocates – whether celebrities or professional bloggers – that they respect. Google’s Shopping Insights tool also shows you how customers search; and you can use it to get an idea for any brand, product or service. It allows you to break information down by time and location to see where your potential customers are, and their search habits. Continuing the fashion theme, this example shows ASOS data. How do your customers learn about your brand, and which media will be more effective? 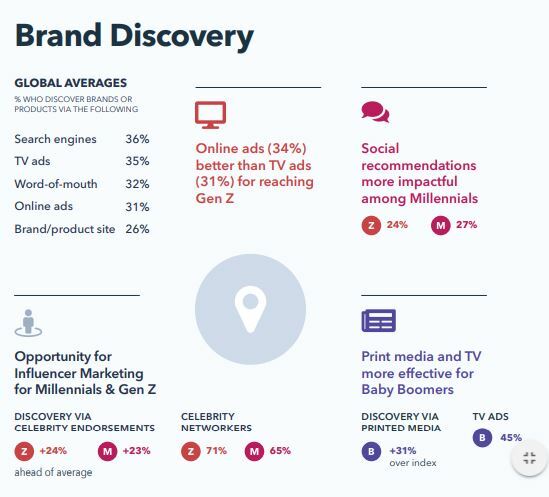 Unsurprisingly, given their research preferences, online ads and influencer marketing play strongly with Gen Z and Millennials. But if your audience is primarily Baby Boomers, you shouldn’t neglect more ‘traditional’ forms of marketing communication. This age group is still a strong consumer of print media (which covers direct mail, as well as print advertising, magazines etc) and TV advertising. Of those who purchase online, 73% (of all age groups) have used a combination of desktop, phone and tablet or other mobile device. The lesson for you? A seamless, device responsive online platform is vital, to allow your customers to switch from one device to another at will. 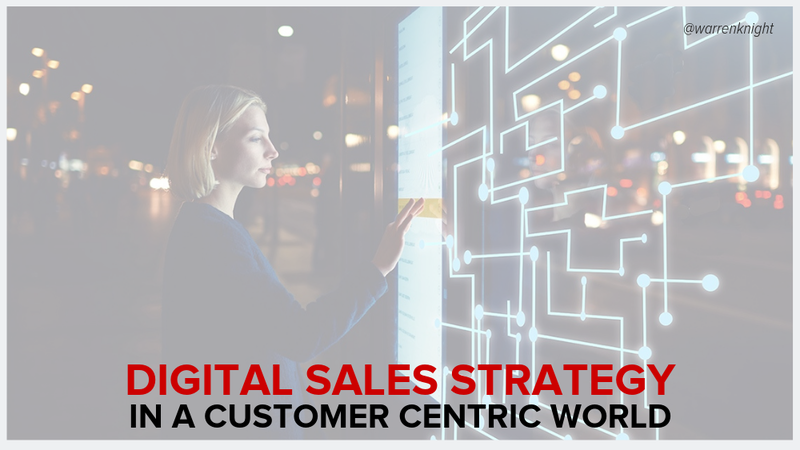 Technologies which enable your brand to follow your customer from device to device are readily available, and your customers will thank you for your investment – in purchases! Millennials are currently the biggest online shoppers – but remember that Gen Z are true digital natives, and their spending power will increase as they progress into adulthood. If Boomers are your target, consider that 71% have identified free delivery as important, and compare your service terms to those of your competitors to ensure you’re not missing out. Do you know what your customers most value about a brand and how loyal they are likely to be? The specifics will depend on your product or service, of course, but the Global Web Index research has some useful insights into broad attitudes. The older your customer base (Boomers), the more likely they are to buy on price – looking for the best deals and even avoiding the ‘premium’ versions of products in favour of cheaper options. 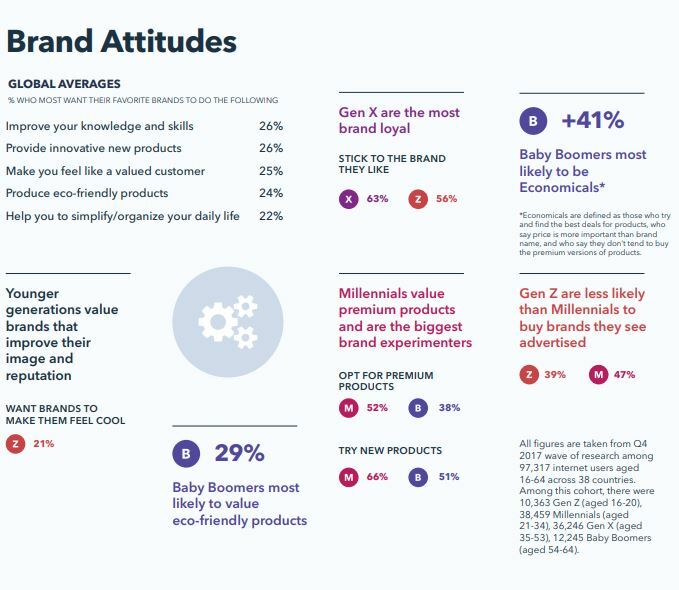 Millennials are the most likely to value a premium product, or experiment with new products, whilst Gen X are the most brand loyal. Let’s say your target audience is primarily Boomers, looking for a good deal. 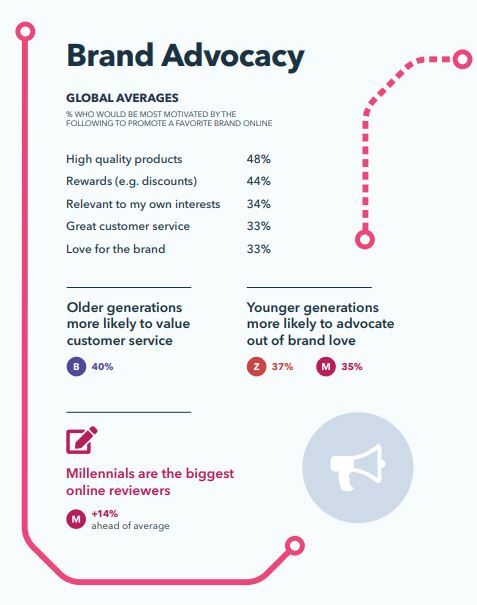 But the older generations are also the most likely to value customer service. So you might get your price point right, but you can’t afford to make the mistake of thinking that because you’re offering a great deal on price they’ll accept a lower level of service! The biggest lesson here is that, whether you rely on a human salesforce, automated marketing, AI or a combination of everything, your sales process can only ever be as good as the information you have about your customers. The more you know about who they are and what they want, the better able you will be to devise a sales process which builds rapport and relationships, and gets sales. My blog “How Artificial Intelligence enhances personalised communication” gives you further insights into how you can use the latest technologies to build stronger relationships with your customers in this digital age.